The lives of Roxie and Alfred are about to change forever. They will soon face the criminal underbelly of the big city, the hopelessness of the Great Depression of 1929, and the stress and loss of WWII. 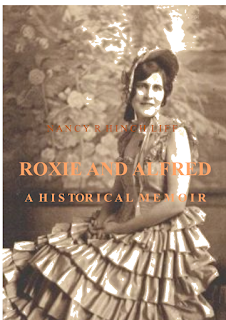 Roxie and Alfred: A Story of Courage, Resilience, and Survival tells the tale of one courageous American family who leave behind their safe bucolic life on a southern farm to seek fame and fortune in a thriving, gritty northern city at the height of prohibition, when organized crime, violence, and fraternizing with gangsters was a way of life. The book is structured thematically around the phenomenon of survival and the ways in which individuals, when challenged, construct their own survival tactics. At the age of 64, Nancy Hinchliff, a retired school teacher with no business experience and little start-up money leaves her hometown of Chicago, buys a turn-of-the-century mansion in Louisville, Kentucky on a whim, and turns it into a charming Victorian Inn. Through sheer tenacity, she learns the business on her own while successfully coping with one mishap after another. In this humorous and engaging tale, the author deftly wields her way around cantankerous contractors, harrowing housekeepers, and no shortage of strange and interesting guests and events. 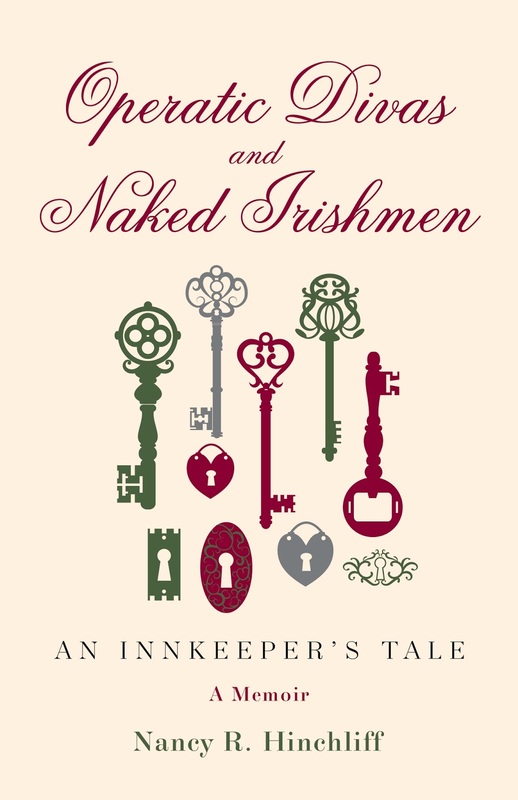 Through her collected stories, Ms. Hinchliff gives readers a personal, in-depth, and honest look at what it’s like to be an innkeeper and still keep your sense of humor as she candidly describes her challenging twenty-year journey. “What happens when a retired Chicago teacher with no start-up money or business experience leaves everything behind to start anew in Kentucky? Her life begins to change and a collection of entertaining stories ensues. Nancy Hinchliff discovers that Old Louisville is filled with beautiful 19th-century architecture, but it takes her a while to realize that the Victorian neighborhood she will call home also comes with an assortment of curious residents---quirky locals, and unsavory characters---who soon expose the underbelly of a neighborhood in transition. "Moving into the hotel trade at any time is quite a feat, but at the age of 64 and in an unfamiliar city? Nancy Hinchliff regales the reader with the hilarious ups and dramatic downs as she turns a run down period house into a Victorian inn to be proud of. 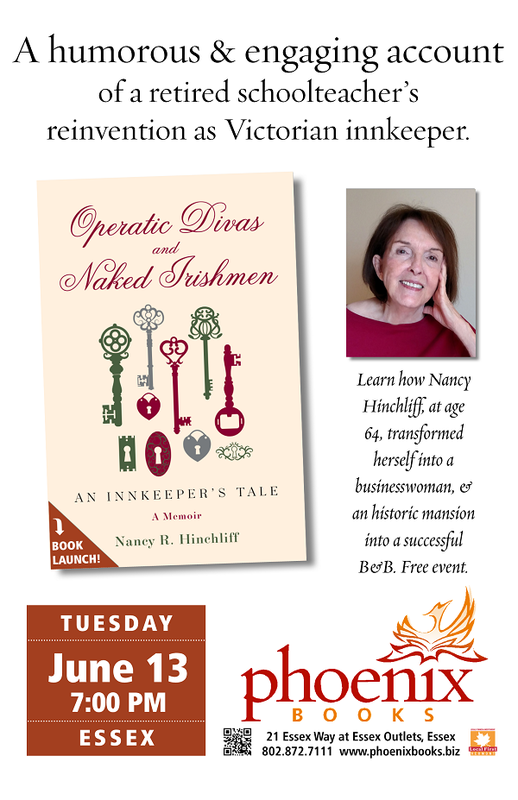 Nancy provides us with an honest, and undeniably charming, account of the struggles and triumphs of her time as an innkeeper. It is a revealingly personal account of what it took to get her business and her new home off the ground and ultimately how it enriched her life. Operatic Divas and Naked Irishmen by Nancy R. Hinchliff is the engaging story of the author and her journey of transformation and self-discovery. Her story of transformation from that of retired school teacher to that of a successful innkeeper is indeed uplifting and encouraging - how she finds her way through the harrowing times that are connected with being an innkeeper. Her personal experiences and stories are interesting and entertaining, and they show the transition in her life as she buys a mansion and transforms it into a Victorian inn. It is a story of courage, determination, and mental strength. I found the author’s personal journey uplifting and inspiring, and the manner in which she reinvents herself is creditable. The problems she faces while being an innkeeper and her personal experiences are palpable to readers. She shares some delicious recipes as the book progresses and that gives readers an idea of some of the dishes served at the inn. The narration is straightforward and simple, enabling us to connect well with her stories. I like the way in which the author shares her easy-to-make recipes while narrating her experiences as an innkeeper. She weaves them nicely into the book in a way so that they do not read as if they are forced. 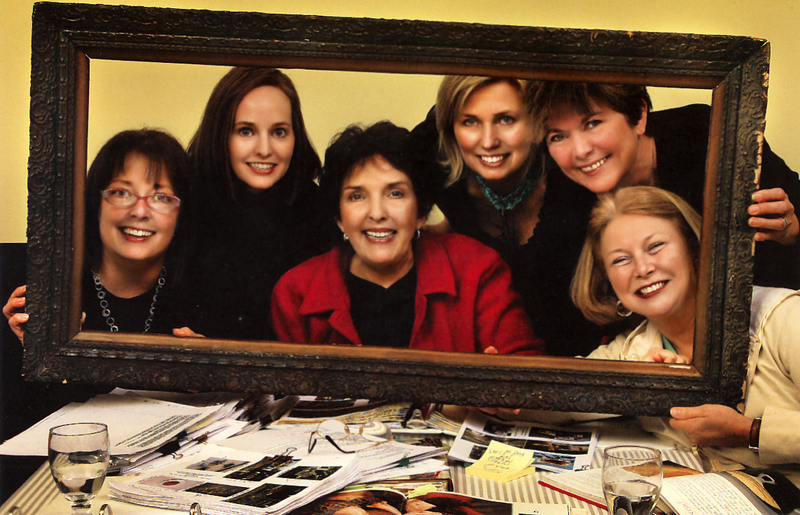 The memoir is warm and the food, the décor, and ambiance she shares with us evoke a nice feeling while reading. Apart from the story, the book conveys some strong and thought-provoking messages to readers through the author’s life experiences. 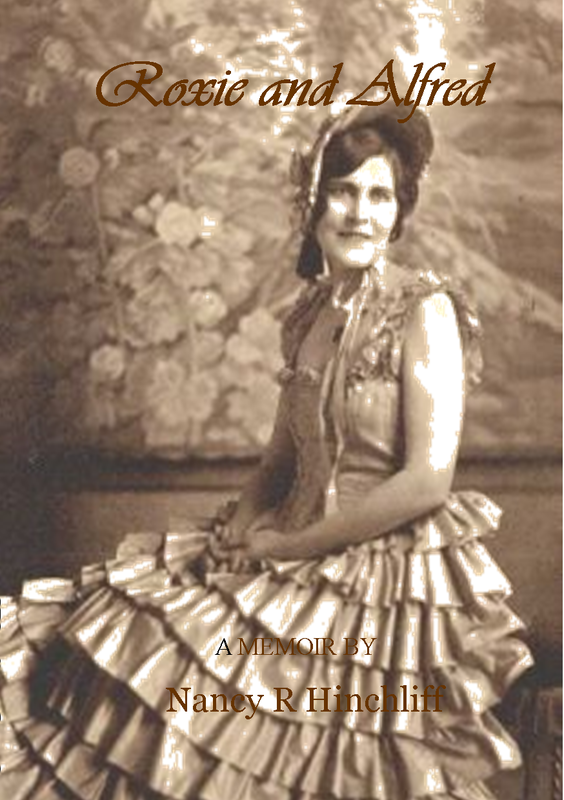 Her approach to life is worth a mention and readers learn about it while reading the memoir. Before I finished Operatic Divas... I started Roxie and Alfred (my grandparents). It feels finished to me but is quite short, only 110 pages. I decided to write about them because they were such amazing and interesting people. 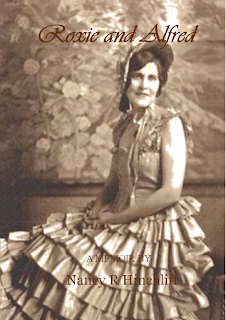 Their move from a small farm town in North Carolina to the bustling northern city of Detroit during the twenties was not only amazing and interesting, but courageous, . By the time I got to high school, they had moved to Tampa. Papa (which is what I called Alfred, my grandfather) built the house they lived in. I would go down and spend all of my summer vacations with them, helping him to build the house and palling around with him. Eventually, when I graduated, I lived with them for a year and attended Tampa University. When I didn't have classes, Papa would wake me at 5:00 in the morning and we would go digging for clams by ourselves. He would pack a lunch, grab his clamming equipment, hitch his row boat to the back of his truck, and off we would go on another adventure. "I still remember those wonderful daybreak mornings walking on the wet sandy beach, my summer pants rolled up, the morning air filled with the fishy smell of the salty sea. Warm breezes brushing against my skin, blowing my hat away, so that my hair flapped around my face, tickling. The tide on it's way back out and seagulls swooping back and forth, screeching overhead or along the shore where there were always other clam diggers. We'd put on our old sneakers so the sharp shells wouldn't cut our feet. and wade out into the water, so clear we could see down to the sandy bottom. The clams knew when there was danger nearby so they would start to burrow down beneath the sand. The object was to grab one and pull it out before it disappeared. Sometimes we would use clamming tongs, which were easier for me, but Papa always used his hands. Another place we looked was on the wet beach just a ways beyond the water's edge. There would be small holes all up and down the beach. Papa could tell which ones had clams hiding underneath. We'd use our hands to dig through the sand until we found the clam, then throw it into our pails. After a couple of hours, we would have a bucketful of clams and a very red sunburn. Then we'd find a shady spot under a weeping willow and have our lunch. By that time, it would only be around eight o'clock in the morning but lunch hit the spot. We'd ride home, sandy--wet feet--and all, with the windows down and the wind playing havoc all though-out papa's truck. What a glorious start to the day. Roxie would be waiting at the door for those fresh clams to make her famous chowder..."
Sunshine streamed through my window and the smell of strong Cuban coffee drifted into my room. I was already dressed, so I squiggled down to the bottom of the bed, threw open my green suit case, and rummaged around for my comb and brush. Then I pulled out my summer sandals, slipped them over my bare feet and shuffled into the kitchen. Yes, you are," Roxie said. "Where did you think you were?" "When I first woke up, I thought I was still in Detroit. But I'm here. And I'm so glad." My face automatically stretched into a broad smile. I was so happy. I let it sink in for a minute. What a good feeling. "Grandma, can we go to the beach today?" “Well, I suppose so. But I want to go early so we can come back, eat lunch, and take a nice nap. We’re going to Ybor city tonight to the Columbia restaurant. Your auntie Flo and uncle Spencer are coming too. How about some breakfast?" " OK, what do you have? "Maybe just some toast and orange juice." By the time we finished breakfast and cleaned up and I had unpacked all my clothes, it was around eleven o‘clock. "Time to go to the beach" I had put my bathing suit on, grabbed my beach towel and sunglasses and ran to find papa. "Outside waiting for us" Roxie said. I walked outside and there he was, under the lemon tree smoking his pipe, tiny grey ringlets floating towards the clear, blue morning sky above him. "You're gonna put that thing out, aren't you Alfred?” Roxie said. She closed and locked the back door. “Yes, before we get in the car, darlin” He was already tapping the ashes out into an empty coffee can. We threw our stuff, a few old quilts and a cooler with drinks, ice, and sandwiches, into the trunk and piled inside the car. Papa took off like hellfire and got us out to the causeway in record time. He had rolled down all the windows so Roxie sat up front struggling desperately for miles to tie her hair down. I sat in back, the wind playing havoc across my whole body. As we got closer to the causeway, I took a deep breath. The fishy smell of the shore and the sea air was heaven. My heart was pounding and I could feel the blood rushing up and down inside my body. What a glorious day it was. Papa found a great place to stop and park the car under a huge shady Pine tree. Roxie had brought a big green and white striped beach umbrella and papa pulled it out of the trunk. He sunk the pole way down into the sand then took out three beach chairs and set them under the umbrella. Roxie carefully laid the quilts out in the sun and I brought the cooler and all my personal stuff. It took us a while to set up, but soon we had a great spot to spend the next couple of hours. The Florida sun is so hot, Roxie warned me, that I wasn't to get out in it for more than an hour or so. She instructed me to sit under the umbrella most of the time. I slathered my whole body with suntan lotion and took off for the sea. I wasn't much of a swimmer, so I would wade in up to my waist, jump around a little, and then plop down at the water's edge. In a few minutes Roxie joined me and we paraded around like a couple of bathing beauties while Papa took a long walk on the beach. The Atlantic is usually pretty cold but on this day the temperature was perfect. The time went by so fast that I was surprised when papa whistled that it was time to go. "OK, papa, here we come." Roxie and I had collected seashells which she said would look pretty in a round glass bowl on the coffee table. We walked to the car, still wet with sand scrunching around inside our bathing suits. I had picked up the quilts on the way and folded them. After a couple of trips, we had loaded the trunk and were ready for home. I opened the back car door and spread my beach towel, now completely dry from lying in the sun, over the seat, jumped in, and closed the door. Papa started the car, hit the accelerator, and whirled us around in the sand like we were about to compete at Daytona Beach. "Alfred!" Roxie grabbed the side of her open window and shoved both feet into the floorboard. "Alfred! What's the matter with you? Jesus wept!" That was Roxie's favorite saying. I had no idea why Jesus would be weeping just because papa was skidding the tires, but he most certainly would have been drenched by then. "Oh Roxie, just let me drive, woman." We zoomed onto the highway, Roxie wrapping her head in a bright yellow-flowered scarf as quickly as possible. "Well drive then, ole man!" she snapped back. And drive he did. We made it home in no time, unpacked the car, and dashed to see who could reach the bathroom first. I, being younger and faster, won of course. I could hardly wait to get out of my cold, wet, sandy bathing suit. I turned on the shower, set it to warm, and jumped in. The warm water grazed my body and cleared away every trace of sea and sand. I slathered myself in Roxie's lavender bath gel and waited while the water rinsed it off and sent it gurgling down the drain. I grabbed one of Roxie's fluffy white towels and wrapped it around me. When I opened the door, there was Roxie waiting impatiently to get in. "Go take a little rest, honey. We'll be going to Ybor City in a couple of hours. Auntie Flo and Uncle Spencer will be here soon." 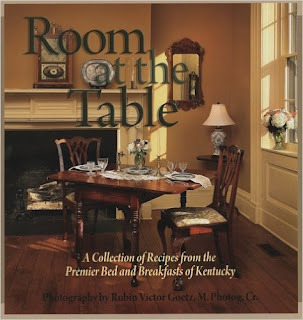 When I was still an innkeeper in Louisville, I worked with a committee of other innkeepers to co-produce a coffee table cookbook for the Kentucky Bed and Breakfast Association. We did all of the research, recipe testing, fund-raising, and styling for our photographer. We traveled by caravan from inn to inn all through-out Kentucky gathering information and recipes, writing, and making decisions concerning the cookbook. It took two years to complete the project. The book was a huge success and is still available on Amazon and other major book outlets. When will Roxie and Alfred be published? I'm looking forward to it.